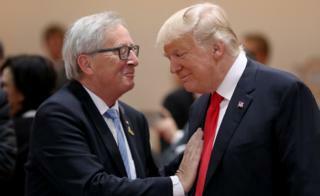 The United States has ended a spat with the European Union over diplomatic protocol that came amid heightened tensions over trans-Atlantic trade. US ambassador Gordon Sondland said the bloc was "one of America's most valuable partners in ensuring global security and prosperity". The dispute surfaced in January over an apparent downgrading of the EU's diplomatic status. The EU said it was pleased the US had decided "to revert to usual practice". Early this year it emerged that the US had changed the way it treated the EU delegation and ambassador. The EU had previously been treated "as a country would be" on the US diplomatic list but was now being seen as an international organisation, which is ranked lower. The EU ambassador was the last diplomat to be called up at the state funeral for President George HW Bush last December, according to Deutsche Welle. Has Trump turned his back on Europe? Trade relations are still tense and diplomatically three EU states have tried to find a way around US sanctions re-imposed on Iran. The EU and US are set to meet this week with the aim of negotiating a trade deal limited to industrial goods. President Donald Trump pulled back from imposing tariffs on European car imports last July, after the EU said it planned to buy more US soya beans and liquefied natural gas (LNG). EU imports of soya beans have since soared. However, US tariffs on steel and aluminium imports which were imposed last year remain in place. Last week President Trump described the EU as "very, very tough" on US farming goods and cars. "We take their product; they don't take ours. We don't charge them tariffs; they charge us tariffs," he asserted, according to a White House transcript. In his statement, Mr Sondland welcomed the EU's new ambassador, Stavros Lambrinidis, praising the EU as a "uniquely important organisation", adding that "this level of engagement and co-operation should be recognised appropriately in all settings". EU foreign affairs spokesperson Maja Kocijancic said that the EU had been in touch with the US to "clarify the matter" after the change to diplomatic practice. "We are pleased that the United States took the decision to revert to usual practice," she said.